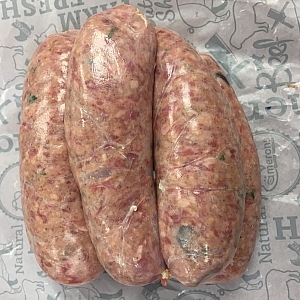 MOROCCAN LAMB SAUSAGES (6 sausages) from Camerons Quality Butchers. Roughly 6 sausages to the pound, these are made from local Newnham lamb, we add dried cumin & cinnamon. dried raisins and apricots, with a squeeze of lemon and finished off with fresh coriander. These are great with a salad in the summer on the BBQ or with some cous cous and seemed veg.